A largely disparate movement that developed in the late 19th century until the early 20th century, the Art Nouveau (which means "New Art" written in french) as it is commonly known-and even worldwide affected every aspect of aesthetics in a catalytic grade. Despite the universal acceptance of the French term, the German name of the movement "Jugendstil" and Austrian "Secession" is equally acceptable, while other names previously received are remarkable more for historic reference: "Stile Liberty" was called in Italy, "Modern style "and, later, when modernism prevailed," Early Modernism "in America," Modernism "in Spain. Additionally, he was named «stile floreale»-while the actual style was already in bloom- a title deriving from the main decorative element, the curved undulating line, which often develops as a stylized flower and its sublime symbolisms. With this line, the picture evolves the surface, in her own space, beyond the rules of Renaissance perspective. As the Art Nouveau movement occurred mainly in the decoration and architecture, but touched all areas of artistic expression and influenced subsequent trends in modern art, it is to be considered a style began to take shape in late 1880, although its edges are placed between 1892 and 1902. After 1905 we find limited and individual paradigms of the style. The name "Art Nouveau" was coined by art critics in Belgium and later became the name of Paris known gallery Maison de l'Art Nouveau, under the direction of Siegfried «Samuel» Bing, a German collector and art dealer who helped in its introduction. In the period from 1896 to 1902, Bing has presented in his gallery paintings, sculptures, vases, jewelry, pottery, stained glass, textiles and furniture. He orders for paintings to French painters Henri de Toulouse-Lautrec, Edvard Munch, Paul Signac, Felix Vallotton, vases designed by Emile Gallé, jewelry of Rene Lalique, fabric designed by William Morris, sculptures of Auguste Rodin sculptures and Belgians Georges Minne and Constantin Meunier, interior decoration of Henry van de Velde and posters of Aubrey Beardsley. The Bing often gave to his friend and collaborator of Louis Comfort Tiffany ceramic works by other artists. But catalytic role in the development of Art Nouveau that is played by the International Exhibition of 1900 in Paris, where innovative new style spread internationally and won. Key features of the movement is the sophistication of form, concerning mainly patterns and elements drawn from nature and close association with the movement of Symbolism. The Art Nouveau associated with Japanese and Gothic art, and Japanese art offered imitation of natural forms and the search for complex motifs. The availability of artists to abolish distances between different forms of art, which they try to unify was another characteristic of Art Nouveau. In architecture and the applied arts, the style of Art Nouveau borrowed several elements from the art of the Victorian era, while adding modern ideas in more abstract elements of Baroque style. The new artistic features of Art Nouveau that is prepared for the later avant-garde movements of the 20th century, such as the Art Deco, expressionism, cubism and surrealism. In architecture, the new movement confronted in eclecticism. With structural rationality and honesty in construction, decoration renunciation of "historical" styles, imitation plant, animal and geometric motifs and further emphasis on the curve, and the lack of free asymmetrical lines indicate concern and searching (organic forms) as the main features, birth architectures very different, and in some cases, highly original. With key representatives Émile André, August Endel, Antoni Gaudí (1852-1926), Victor Horta (1861-1947), Josef Hoffmann (1870-1956), Hector Guimard (1867-1942), Charles Rennie Mackintosh (1868-1928) and Louis Sullivan (1856-1924), in Greece formalities are few and fragmented and there are few examples where developing style of shaping unchanged in one building. However, in Thessaloniki in the early last century built excellent examples of the movement. The most representative example is the Casa Bianca, Mehmet Kapantzis the mansion, the mansion Kapantzis Ahmed, the house Modiano. Thessaloniki and Istanbul serve as role models for other cities in northern Greece, such as Kavala, Florina etc. The Art Nouveau began to appear in the residential architecture of the Athenian center, the facades of buildings with decorations naturalistic settings. Example of the first year is the Kapitsala house, the building on the corner of Themistocles and Nikitara, architect N. Nikolaidis. Many pieces of furniture designed even today along the lines of the style in focus, is -as a matter of fact- crucially influenced by Charles Rennie Mackintosh. Renowned for his chairs with extremely high back and glossy black lacquer, still finds imitators and innovators. Moreover, large furniture based on curved shapes, and covered by stylized floral fabrics is another characteristic of the style. Major designers such as Victor Horta, Henry Van der Velde, Emile Galli and Louis Marjorelle, designed furniture with atonal, free-flowing lines and curves, with moire patterns, and very often nested or formed a female figure or a natural pattern. The most frequently used motifs include exquisite designs and grape vines, flowers and ivy. This furniture is generally made of walnut or mahogany, while sometimes used oak. Works of Art Nouveau can be found even in Greece, but very little belong to the actual era; most belong to the "style", and are not to be considered antiques of this particular era. They often include elements only of Art Nouveau, and do not fall into entirely to the style. Further misunderstandings occur frequently: every stained glass lamp with elements Art Nouveau, which may be a copy of an actual Art Nouveau original lamp is not necessarily “Art Nouveau”, and is not entitled to be called "Tiffany's", as beautiful or special they are. However, it is worth noting that in Greece you can find exceptional quality and style era Art Nouveau objects by mixing Art Deco elements that the French collectors do not appreciate much, despite the fact that it is very impressive. 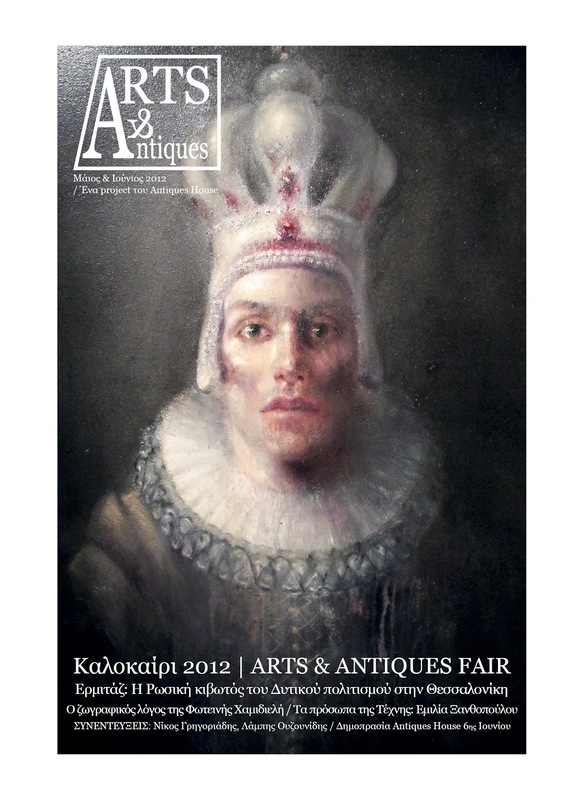 So often in our country are exceptional antiques, real opportunities for Greeks who appreciate this era and its objects.